Cooking juicy and flavorful chops is not such a simple matter – they are often overcooked because they do not all observe the exact time of the cutlets in the pan. In addition, the frying time is not in the least dependent on ground beef, so it is important to know how many minutes you should cook the meatballs, the dish was perfectly toasted. Burgers from home stuffing need to fry in an open pan for 10 minutes, fried them on medium heat, then add a little water (for juiciness) and stew under the lid for another 5-10 minutes. Meatballs-semi-finished products fried on each side for 10 minutes until Golden brown, then they also add water and cook under cover for another 5 minutes. For cooking 20 burgers you will need 1 kg minced meat 2 cloves of garlic, 1 big onion, 100 ml of milk, 250 g of white bread, 2 eggs, 50 g flour and 50 g of parsley. If the stuffing is cooked in the home, the meat can be slightly freeze, so it was easier twisted in a meat grinder. The meat thawed and spread in a bowl, peel the onion, crush and add to the mince with raw eggs and chopped greens. The bread should be broken into pieces, pour their milk, to knead, squeeze and add to meat mixture. Then the meat salted with a teaspoon of salt and stirred by hand for 7 minutes. From the finished stuffing shape the meatballs, run in them in flour and spread in a preheated pan with oil at a small distance from each other. 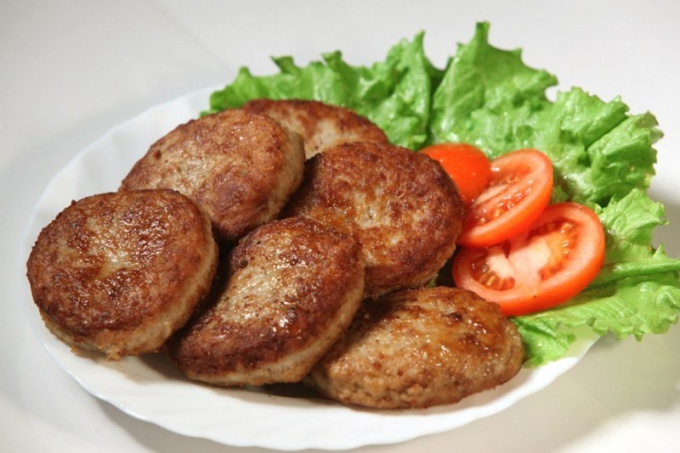 Fry cutlets on both sides for 10 minutes without a lid, then add a few tablespoons of water, so they are already well-cooked on the inside, and frying on low heat for another 5 minutes. The pan before cooking the patties need a good warm up for 1-2 minutes – so they can be quickly covered with a crust and does not lose its juiciness. To check the readiness of the pan by using a drop of water poured into the oil – if the water will hiss in it, the meatballs can be fried. After putting some chops into the pan should be lightly pushed each of them so they do not stick to the heated surface. To cook meatballs in sauce, need to add it to the pan for 3 minutes before cooking. If burgers were underdone inside, you should return them to the pan and saute with a quarter Cup of water under a lid for another 5-7 minutes. For cooking juicy and delicious meatballs, it is important not to overdo it with salt – so, for moderate salinity of 1 kg of meat will be enough for 1-1. 5 teaspoon of salt with a slide. For those who like saltier food, you can put the stuffing 1 tablespoon salt without slides. If the chicken was not salted before cooking, you can serve them cut into pieces and lightly sprinkled with salt or salty sauce. How delicious homemade burgers! And what they have a delicious crust as they loudly shkvorchit in the pan. Unfortunately, not every day you can afford to spend time preparing a delicious home-cooked meals. But if you want, from ready-made frozen meatballs, you can make something original. Wash, slice and sauté mushrooms in vegetable oil. Mushrooms can be taken raw or frozen. Vegetable oil would be good enough for frying. Can replace it with butter or margarine. Preheat another skillet with vegetable oil over high heat. Put her meatballs. Cover the pan with a lid and slightly reduce the heat under the frying pan. Add the sour cream to the frying mushrooms. Lightly salt, stir. Cook on slow fire, periodically stirring the sauce. With a spatula flip the patties and again cover the pan with a lid. Burgers, still, get crisp, and the cover will protect you and your kitchen from splashes of oil, and patties under the lid will be unfrozen as a whole, not just the edges. When chops are well browned on two sides, add the spices to the sauce and stir it carefully. Put the meatballs in the pan with the sauce. Cover the pan with a lid and simmer for fifteen minutes over low heat. Turn off the flame under the skillet with the meatballs in the sauce. Crush the garlic, add it to the sauce and mix gently. Cover the pan with a lid and let stand for five minutes. 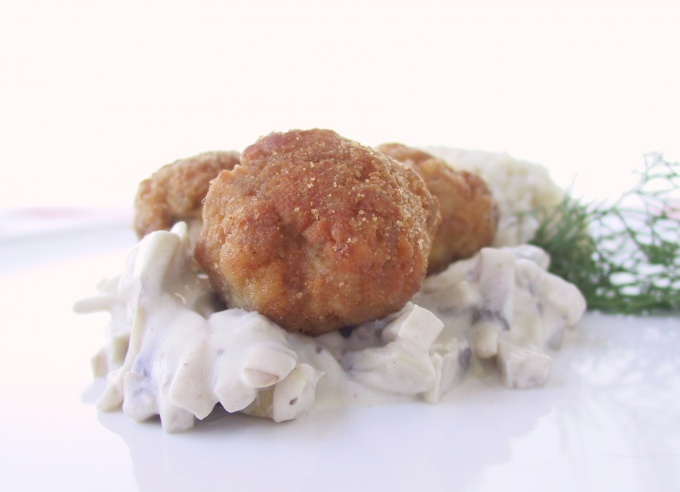 Meatballs in creamy mushroom sauce is ready. They can be served with mashed potatoes, canned peas or the roasted vegetable mixture. Before serving, can sprinkle patties with chopped herbs. Garlic need to add at the very last stage of cooking. Heat-treated garlic greatly changes their scent. To determine whether the fried chicken, pierce chicken with a toothpick. Speaking on the juice should be transparent. For this dish you can take more than fatty sour cream. You can even sprinkle meatballs with grated cheese after you moved them into the pan with the sauce, but then the dish will turn out very hearty, and probably the need for any side dish at all will disappear.